This is a fun exercise that is handier than it seems at first. You'll set up two targets at a distance, and teach your dog to go to either target—left or right—on cue. Later, you will set up similar exercises to bring more general meaning to the cues "left" or "right." A dog that understands "left" and "right" has a terrific skill for many competition venues including agility, herding, mushing, water dog, and retrieving. This understanding would also be handy walking on trails—and service dog owners could think of a dozen or more applications for "left" and "right." Dogs need to learn to work away from their owners, too. Reinforcement does not only come from doing things right in front of you, the pet owner. Many of the most useful behaviors are performed at a distance—recalls, leave-its, and stays, for example. First, you need to teach your dog to touch a target at a distance. There are many ways to teach this, and many specific targeting behaviors that are suitable for the exercise. You could teach a paw-whack, a nose-touch, or even a go-around. Choose one that is most useful to you and, for the sake of simplicity, we'll just refer to that behavior as "targeting" for the rest of this article. A dog that understands "left" and "right" has a terrific skill. Set up a traffic cone and teach your dog to target the cone. This is an excellent application for shaping. If you are teaching a nose touch, it might help to put a little food under the traffic cone, but stand on it to prevent the dog from tipping over the cone and actually getting the treat! You'll get the dog to sniff at the cone; click when you see the nose touch the cone. Treat a very short distance away from the cone to set up the next repetition. Leave the same treat under the cone until your dog has figured out that touching the cone is what pays off. Once you have your dog reliably targeting the cone from a short distance, you need to start increasing the distance. The "300 Peck" method is a fool-proof method for increasing distance. When you can reliably send your dog out to the cone from a distance of about 12 paces, you can start to add a cue. For the purposes of this exercise it would be useful to point with your whole hand in the direction of the traffic cone. When the cue is reasonably well understood, you can move on to the next part of the exercise. Leave the same treat under the cone until your dog has figured out that touching the cone is what pays off. Set up two traffic cones about three feet apart. Position yourself at the corner of a triangle about two feet from both cones. Send your dog to one of the cones by using your pointing cue. Click and treat immediately in front of you. Send your dog to the other cone using your point cue. Click and treat immediately in front of you again. If on the second instruction your dog goes to the first cone by mistake, simply ignore the mistake, wait a few seconds, and then send your dog to the correct cone again. It's fine, even preferable, to set up a predictable pattern, alternating between cones for each repetition. Why is this preferable? You're setting your dog up for success. You can mix it up later on. When your dog is reliably going to the indicated cone each time, you can start to add some distance. Again, the "300 Peck" method is as good as any for increasing distance. 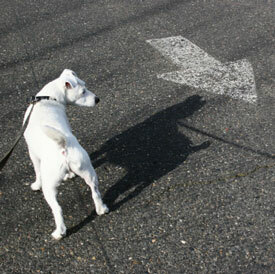 However, your current cue is a little unclear—it requires your dog to follow your pointed hand. As the distance increases, this cue becomes more and more difficult to understand. So don't over-do the distance just yet; keep it within 10 paces. Most dogs will have figured out the pattern anyway, so a cue that is a little difficult to follow doesn't matter too much at this stage. Now it's time to teach your dog left from right. Use "left" and "right" because they are convenient cues. You could use "west" and "east" or "gee" and "haw" or "apple" and "orange" as easily. Immediately before sending your dog to the cone on the left, say "left" and then point. Immediately before sending your dog to the cone on the right, say "right" and then point. When your dog is starting to anticipate going to one or the other cone when you say "left" or "right," it's time to start fading the hand point cue. Use it only as required, or make it less and less obvious. When your dog is starting to anticipate going to one or the other cone when you say "left" or "right," it's time to start fading the hand point cue. Now you have a dog who understands left from right! How cool is that? Alone that is a great party trick, but to be really useful you need to start giving some more meaning to the cues. At this point your dog has probably figured out the pattern—left, right, left, right. So start mixing it up; send him to the left cone twice in a row, then the right cone twice in a row. Make it a random pattern. If your dog will perform a formal retrieve, set up two dumbbells and have your dog retrieve the "left" dumbbell or the "right" dumbbell. If you train in agility, set up two jumps and send your dog over the "left" jump or the "right" jump. Whatever your intended application, think of a way to give more meaning to the cues specific to your field of endeavor. You may be surprised at how your clever dog can understand these cues and use them in new situations! Submitted by vapy on Wed, 2011/02/09 - 4:31pm. Submitted by jake moriarty on Sun, 2011/01/16 - 3:17pm. sounds like a very clever fun way of teaching my puppy and future sheep collie. Submitted by rbgold on Thu, 2010/07/22 - 6:29pm. I've been playing around with clicker training, clicking for eye contact and touching a frisbee on the ground. I could play 'left/right' with 2 frisbees. My DH would flip! Submitted by Julie More on Fri, 2010/02/05 - 2:28pm. Great article. Nellie (my rescue aussie) is such a smart dog. I am always looking for new things to teach her. Fun Games For Your Dog: Spin the Bottle!